As a professor, I work hard to help my graduate students in education attain knowledge and skills such as teamwork and collaboration, reasoning, innovation, appreciation of diversity, conflict resolution and much more. My modeling of how these skills are learned provides a foundation for them to help students everywhere acquire these capabilities. Part of my challenge is that students must master applying such capabilities not only in academic settings, but also in complex, authentic real-world contexts. Diagnostic assessments are embedded into deeper learning methods and formative for further learning and instruction. At Harvard, given ample organizational resources and internship sites in the Boston region, this type of teaching is much more feasible than at other colleges or high schools that are less wealthy and more isolated. Further, for middle school and younger students, arranging real-world apprenticeships is difficult everywhere. Fortunately, virtual worlds and augmented realities now offer the opportunity for all students to experience simulated internships without leaving their classrooms. Two types of immersive media support a growing number of formal and informal learning experiences. Multiuser virtual environments (MUVE) offer students an engaging “Alice in Wonderland” experience, in which their digital avatars in a graphical, virtual context actively participate in experiences with the avatars of other students and with computerized agents. 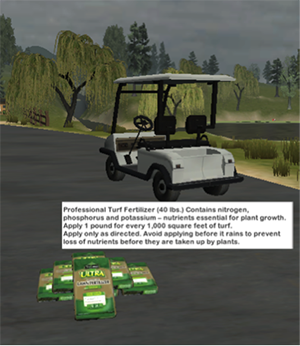 Augmented reality (AR) allows students carrying mobile wireless devices through real-world contexts to interact with virtual information, visualizations and simulations superimposed on physical landscapes. My colleagues are designing and studying curricula that combine immersive virtual ecosystems (EcoMUVE) with AR-based, real-world ecosystem experiences customized to build on those virtual worlds (EcoMOBILE). The EcoMUVE middle grades curriculum (ecolearn.gse.harvard.edu) is inquiry-based. Students conduct research by exploring the virtual ecosystem and collecting data from a variety of sources over time, assuming roles as ecosystem scientists in an immersive and authentic simulation. 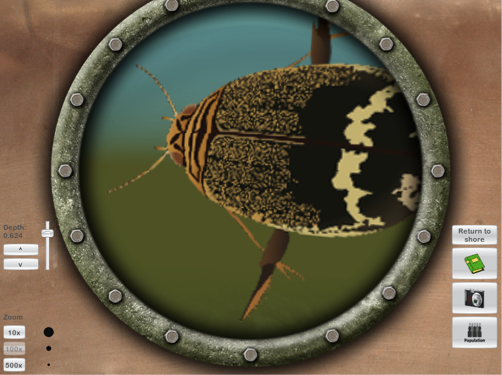 For example: Students can explore a virtual pond and the surrounding area, even under the water; see realistic organisms in their natural habitats; and collect water, weather and population data. They visit the pond over a number of virtual days, eventually making the surprising discovery that, on a day in late summer, many fish in the pond have died. They are challenged to figure out what happened, traveling backward and forward in time to gather information to solve the mystery and understand the complex causality of the pond ecosystem. Figure 1. 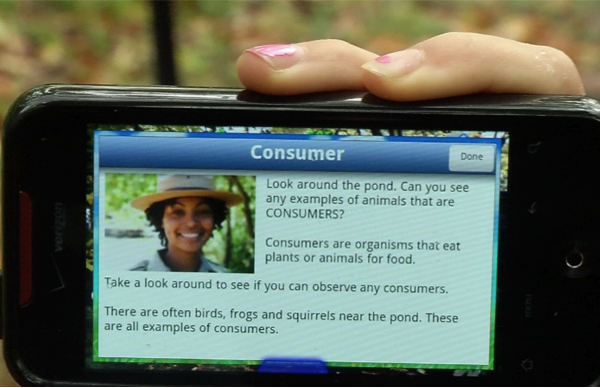 Students can collect water, weather, and population data at the digital pond. Figure 2. The submarine tool allows students to see and identify microscopic organisms. Figure 3. 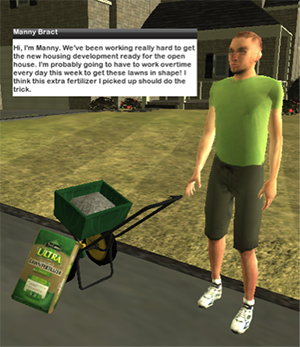 Talking to Manny and observing the bags of fertilizer. Figure 4. Summarizing and interpreting data gathered over time. With EcoMOBILE, using cellphones and tablets, students build on activities they experience in the EcoMUVE by conducting followup investigations in the real world. At hotspots, students experience visualizations overlaid on the real environment, as well as interactive media including text, images, audio, video, 3D models and multiple-choice or open-ended questions. 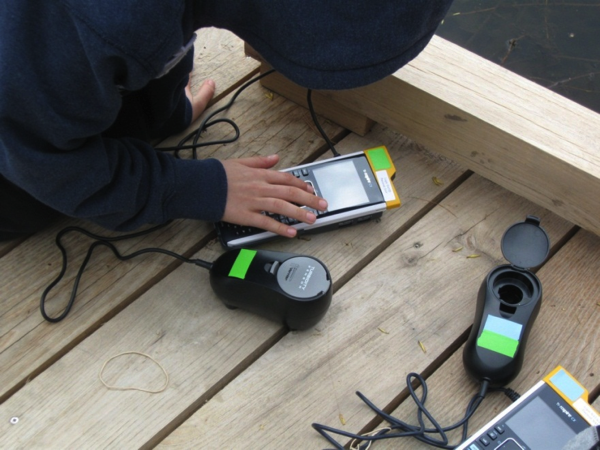 Students collect water measurements using handheld mobile devices with Vernier environmental probes. Figure 5. Handheld device delivering information about students’ research assignment. Figure 6. Collecting water quality data on turbidity using digital probes. There are many benefits to using this complementary suite of immersive media to enable multiple dimensions of deeper learning: case-based instruction, multiple linked representations, embedded diagnostics, collaborative knowledge building, simulated apprenticeships and learning for transfer. In time, immersive authentic simulations will make deeper learning attainable for all students, everywhere. Today, the primary barriers in transforming to a deeper learning educational system are not conceptual, technical or economic, but instead psychological, political and cultural. Some people oppose any form of educational change that is not fully understood, arguing that traditional schooling was effective for them and that innovators should not “experiment” on children. But the most dangerous experiment we can perform is to keep our current systems of schooling in place. Whether we have the stakeholder commitment and societal will to actualize a transformation to deeper learning remains to be seen.